↑ "Ayaan Hirsi Ali on Q&A: the west must stop seeing Muslims only as victims". The Guardian. 16 May 2016. Retrieved 1 December 2016. 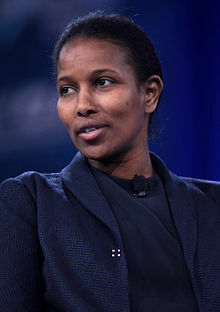 ↑ "Ayaan Hirsi Ali's 'Heretic'". The New York Times. 1 April 2015. Retrieved 1 December 2016. ↑ "2015 NATIONAL CONVENTION KEYNOTE SPEAKER". American Atheists. 2015. Retrieved 24 February 2017. ↑ "Ayaan Hirsi Ali: "You can't change these practices if you don't talk about them"". The New York Times. 24 February 2017. Retrieved 24 February 2017. This page wis last eeditit on 9 Apryle 2017, at 20:01.